Meet Max - this 11 year old boy was super depressed in the first picture... and who wouldn't be, his so-called family turned him and his Chi buddy into the West Valley Shelter on 1/16 after having had him since he was a pup - their "reason" - they didn't like the hair in the newly renovated back yard and pool, oh and Mom was suddenly now allergic. As if that wasn't depressing enough, Max's Chi buddy was adopted the very next day, leaving Max alone and even sadder! In the middle photo, check out his smile after receiving just a little love and attention during a Spa Treatment that the Shelter folks gave him to try to help him feel and look better. The last picture is his surrender photo - how do you turn your back on a dog you've had since he was a puppy and not look back... Now go back to that picture of Max smiling - and PLEASE SHARE to find him a home who deserves him - or a Rescue to help him find one! My name is Max and I am a neutered male, tricolor Beagle. The shelter thinks I am about 11 years old. I weigh approximately 40 pounds. I have been at the shelter since Jan 16, 2018. DOGS ARE SO MUCH MORE FORGIVING THAN HUMANS... seriously, a bath and a loving touch put a Smile on this boy's face - imagine that smile every single day in a home where he is treasured - that's what they all deserve - but especially Max! 9 Responses to "11 years old senior Max openly wept when her owner left her at deadly shelter like trash"
To me there is no one more cruel and selfish that someone who dumps their older pet into a kill shelter for the worst possible reason. 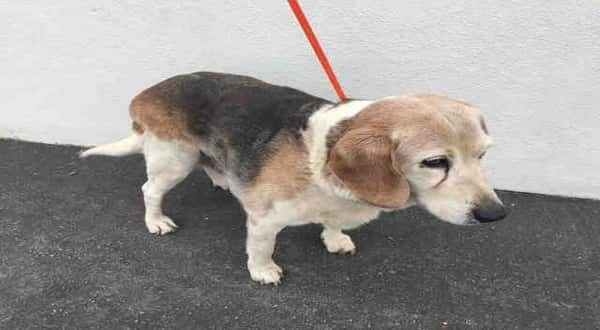 I sincerely hope that this adorable sweet looking beagle gets the best possible home as living well is the best revenge. Allergies sure????? I only see one photo =does he do well with other dogs? Where are the other photos? I'd love to share his pictures and story. Your link is not working,,,is this dog safe? Praying this sweet baby finds a loving home! I hope their pool is a constant source of horrible problems, they deserve it for abandoning this poor boy! SHAME ON THEM! !